Our client is a very upbeat older woman with a very warm home, I feel lots of protection and ease there. When we first came into the house Daniel had a reaction and pulled me aside. He told me last night he had a dream of a lady sitting in a wheel chair. He and Ctina went over to our Clients home prior to doing the investigation to gather information. 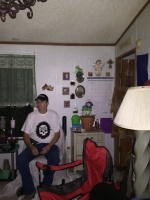 Daniel said he was sitting in a chair and noticed when we got to the investigation that the chair he was sitting in was the sister whom died of our Client's wheelchair and she purposely covered it up and put objects around the house to see is we get anything from them. Well, we did! She is one of 4 sisters, 3 have passed in roughly the past year. They were not OLD but health issues happened. Our client also has health issues. Janice passed most recently at a nursing home but had not been there long as she had been receiving home health services. 5/10/16 she was 68. Janey passed in Pennsylvania on 7/13/15, at 65, 5 days after Judy passed in Montrose on 7/8/15 at 66. The family came from Salem, Massachusetts and actually had a proper family home on Gallows Hill. Which for some reason means something, I feel. Daniel feels an older uncle type around, during the interview. Our Client stated she used to see shadow people before Janice's passing, going into the mirror in the living room and sometimes coming out of the mirror in bedroom. However, has not since her death. She also desires to have them back, or some sign to know she is not without her sisters. We started our investigation around Midnight and finished up around 4:00 AM. When we arrived we were greeted by a wonderful lady with lots of energy. We placed our equipment up and discussed a little bit more and took a walk around the house. We also brought balloons which when we got there the helium was almost gone and would only float about a foot to two feet and some did not float at all. We use these to view the air flow but discovered more by using these balloons. While starting out we did have communication with a Man that seemed to be talking to the spirits and relaying messages back to us. We did get names and responses. The first response was with our flash lights. They would turn on and off on command. Daniel asked told us he did not understand that the spirit seem fixated on the left flash light. We usually get responses with the right flash light. Our Client told us her Uncle Dickie is left handed. We also got other responses from the Spirt Box. 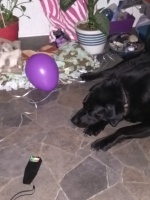 We were sitting in the Front Room and one of the balloons was next to our Client and it started to go up and down rubbing against her. It was so Awesome to watch this. The spirit also made a hanging decor move upon command that was in her bedroom. 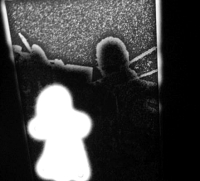 We used a new app to see spirits and we found a man standing behind the ghost figure which is there to only let us know there is a spirit in the room. The man looks like her Uncle Dickie. We had a bad spirit try and communicate with us. He had a very deep voice. At that point, we smudged and placed black salt around her property and inside her home to keep all evil and negative energy out. After we were done with that we noticed that the tone in the home went back to what it was before the bad spirit came in. Even the dogs were acting crazy and barking like they normally do not do. We had all the utilities turned off in this home and our KII box was going off like crazy. Not continuously, but when it did it went all the way to red many times. We also noticed many areas with a change in temperature.